It’s technically spring (although you wouldn’t know it from the NYC weather we’ve been enjoying), and with a little hint of a temperature close to 50 degrees, I have a hankering for a spring cleanup. This also means spring cleanup of my yarn, which is a Sargasso Sea of crap that I hide behind our couch in the den. It’s like a scene from a horror movie when people come over and accidentally peek behind the couch. I can’t even post a photo – this is a family blog. So, in addition to taking stock of current yarn and tossing some crap I can’t remember purchasing, let alone remembering why I purchased it, I took a look at some old finished projects I abhor and never wear. 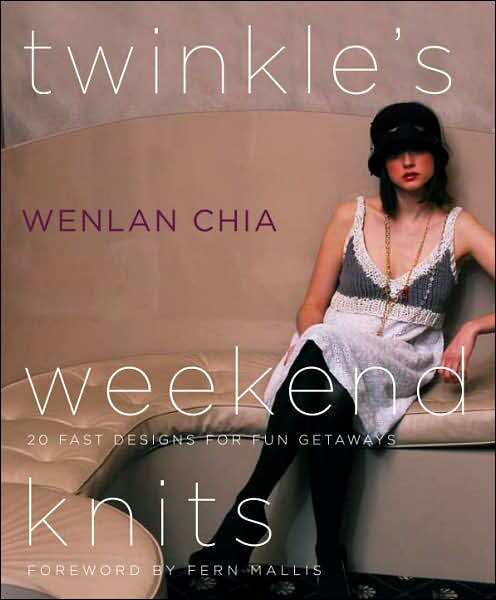 One was a huge sweater from Twinkle’s Weekend Knits, a great book with lovely items made for tiny, skinny women. Every time I don a super bulky sweater made with yarn of the same, the effect is sausage-like. So, I undid an old sweater made from a couple of hanks of Twinkle’s super bulky and figured I’d knit up some accessories right quick. 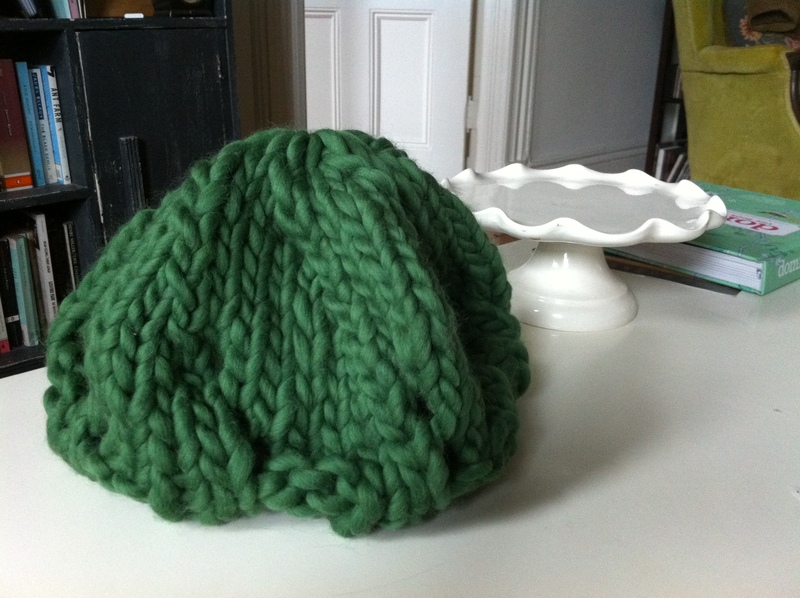 That is a huge benefit of bulky yarn – for people without patience, it’s a godsend. 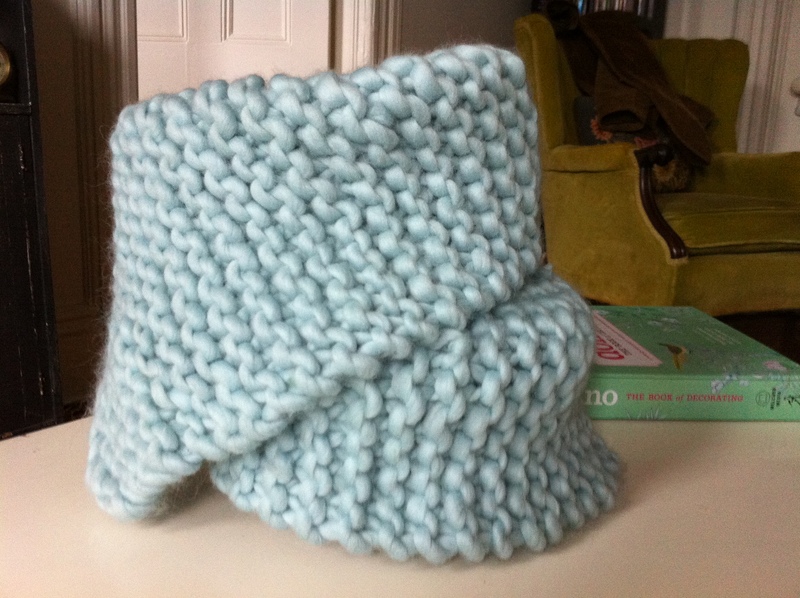 So, with hanks of Twinkle’s Soft Chunky (bulky weight) in Icy Blue and Kelly Green (which doesn’t appear available on the Classic Elite yarns website, oddly), I made two hats and a cowl, I guess it’s a cowl? tion a particular kind of bulky yarn, but I threw caution to the wind and used Twinkle. The result is pretty cute, but the bright green made it seem more broccoli than mushroom. Either way, if you don’t think specifically about broccoli, it’s an okay/wearable hat. pretty good for skiing. It’s currently being modeled on my cupcake plate! One problem to solve for the future, I didn’t do a great job of hiding the knots where I needed to join pieces of yarn together. Hmm. Lastly, I just threw together yet another version of the Urchin hat from Twinkle’s Weekend Knits. It’s cute and floppy, but beret-like so it looks fairly polished for work. The green is a nice bold energetic color and I think it works. I wore a version I made in a very light gray for most of this past winter. And now, I’ve gotten rid of all my green and a big portion of the blue. A small victory in stash busting.